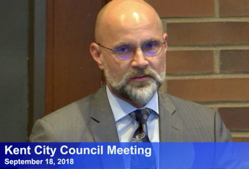 Money stripped from Kent’s ShoWare center was restored by the King County Council thanks to last minute efforts, said Mayor Dana Ralph at Thursday night’s City Council meeting. The Mayor said that the King County Council unanimously approved $200,000 annually for the facility. The money had earlier been removed in favor of a controversial $135 million approval of public funding to spend to upgrade Safeco Field. The city took a bite out of crime over the past summer with emphasis patrols, the assistant police chief told the council at its Sept. 18 meeting. 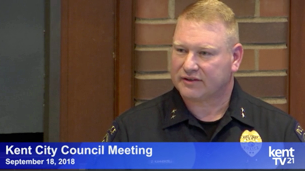 “By the time we did our fourth emphasis there was a very low racer presence and it became difficult to find racing events in Kent, so that is really good news,” Assistant Kent Police Chief Derek Kammerzell told the Council. There was a total of 75 arrests mostly for trespassing in the second degree, and 37 vehicles were impounded and dozens of tickets were issued. “So we definitely put a dent in the illegal street racing and we will continue to address this issue,” the assistant chief said. He announced that two sergeants were promoted to commanders, Andrew Grove and Robert Hollis and both will be assigned to the department/s patrol division. The Council oversaw the swearing in of three police officers, Justin Campbell, Brandon Hamilton and Kelly Robinson by Mayor Dana Ralph. Kent Kammerzell (pictured below) said that Robinson was a police officer in California before returning to hometown Kent. Campbell and Hamilton are new officers. Kammerzell told the Council that four emphasis patrols to halt street racing in Kent, including working with businesses to put up barriers. He said the number of racers decreased each time the emphasis patrol was used. Derek Matheson, Kent’s chief administrative officer, told Council the mayor’s proposed 2019-2020 operating and capital budget will be presented to the city council at a special meeting on Sept. 25, at 5 p.m., followed by a workshop to give members a chance to ask questions of city staff. On Saturday, Oct. 6, the Council will have a “special workshop all day” for department directors to present their budgets and members will be able to ask questions. The Council confirmed Mayor Ralph’s appointment of Michael Frans (pictured above) as a municipal judge for the Kent Municipal Court. Frans will begin on Jan. 1, 2019 and serve the remaining three-year term of retiring Judge Karli Jorgensen. The Council also approved the application of Lake Meridian Ridge as a new neighborhood council. It includes 76 condominium units, the city said.